NEW YORK (AP) The New York Mets probably won’t skip Jason Vargas‘ next start. Vargas returned to the rotation with five excellent innings, AJ Ramos pitched out of a bases-loaded jam in the sixth and the Mets beat the Miami Marlins 2-0 on Monday night. Asdrubal Cabrera had an RBI double and Wilmer Flores added a run-scoring single as the Mets got their fourth straight win, following up a three-game sweep of NL West-leading Arizona. New York is 6-2 in its past eight games, 5-1 on this homestand and 24-19 overall. 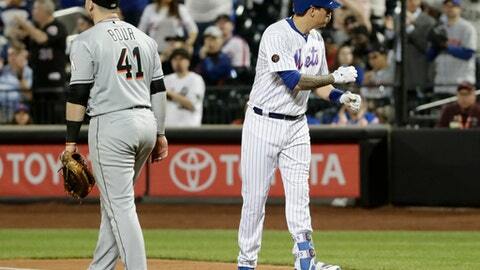 The 35-year-old Vargas (1-3) had his previous turn skipped after three sloppy outings to open the season, but he shut down Miami with changeups and guile for his first victory with the Mets. Ten of his outs came via the change, and he struck out seven without reaching 90 mph even once with his fastball. He allowed two hits and a walk before leaving after 86 pitches. ”I think the more weak contact you get or miss-hit balls or swings and misses that you get are going to give you more confidence,” Vargas said. New York used three pitchers in a scoreless – but eventful – sixth inning. Paul Sewald got two outs but put two on before left-hander Jerry Blevins entered to face lefty slugger Justin Bour. Blevins walked Bour on a full count and was replaced by Ramos, and the right-hander struck out pinch-hitter Derek Dietrich swinging to leave the bases loaded and preserve a 1-0 lead. ”He’s making big pitches when he needs to,” Mets manager Mickey Callaway said. Ramos followed with a scoreless seventh, ending the inning by beginning a bold 1-6-3 double play on pinch-hitter J.B. Shuck’s hit-and-run comebacker. Ramos’ throw to second narrowly nabbed Miguel Rojas. ”We’ve just got to do a better job of stepping on the gas,” Bour said of Miami’s missed chances. Mets left fielder Brandon Nimmo made a diving catch on Brian Anderson’s two-out line drive to help Seth Lugo escape the eighth unscathed. Jeurys Familia pitched the ninth to cap a five-hitter for his 13th save and New York’s second shutout this season. The game ended when shortstop Amed Rosario went deep in the hole to field Lewis Brinson’s grounder and threw out the sliding speedster by a hair at first base. The Marlins challenged, but a replay review upheld the call. Rosario got a big cheer for a single in the third inning a day after his first multihomer game as a pro. He scored from first on a double to right field by Cabrera that made it 1-0. Miami starter Elieser Hernandez (0-1) pitched through a sore throat and held New York to a run and five hits over five innings. The Rule 5 draft pick from Houston was making his second major league start and dropped his ERA to 2.08 in four appearances. Tayron Guerrero pitched for Miami a day after allowing Dansby Swanson’s game-ending, two-run single as the Marlins blew a five-run lead in the ninth inning of a 10-9 loss to Atlanta. Guerrero worked around a single and a walk in a scoreless eighth. Vargas broke the hamate bone in his right hand during spring training and had struggled since, entering Monday with a 13.86 ERA in three starts. The left-hander signed a $16 million, two-year deal in February to provide rotation depth, but his miserable results led Callaway to skip Vargas’ turn following a loss May 8 to Cincinnati. Vargas threw roughly 80 pitches during a simulated game at Citi Field last Tuesday, fine-tuning his mechanics to better finish his pitches. Callaway could see a difference ”from Pitch One,” especially with Vargas’ changeup. Vargas hit his only spot of trouble in the fifth, when he walked Cameron Maybin and allowed a single to Rojas with one out. Vargas struck out Brinson and Hernandez to strand the runners. Marlins: Activated RHP Odrisamer Despaigne from the 10-day DL and sent LHP Dillon Peters to Triple-A New Orleans. Mets: Devin Mesoraco was checked briefly by Callaway and a trainer during the seventh inning for a bruise on his left elbow. The catcher was struck by a backswing earlier and had a welt on his arm, but remained in the game. X-rays were negative, and Mesoraco said he’d be fine other than some stiffness. … 3B Todd Frazier took batting practice on the field for the first time since going on the DL with a strained left hamstring. The next step for Frazier is to try running without pain. He hasn’t played since May 7 and there is no timetable yet for his return. Mets RHP Zack Wheeler (2-3, 5.92 ERA) pitched two-hit ball over seven innings against Miami in his first start this season but has largely struggled since. He’ll oppose Caleb Smith (2-5, 4.22), who allowed four runs in three innings of a 7-0 loss to the Dodgers in his previous start.